Five hours, Florence, one fidgety husband – what does one do when the universe deals you cards like these that aren’t compatible in any sense other than in an awkward alliteration (alligator)? Last month I had a brief stint in Florence for a work trip, to which I took ze old ball and chain (hubby), and discovered later the itinerary was so jam-packed over the two days we only really had five hours to explore the city. 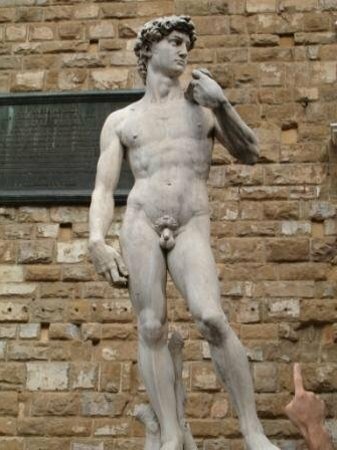 Now, for those who have never been/planning to travel to Florence, I personally advise allocating at least four hours for gelato, PERIOD. Because ICECREAM. Then there’s the Duomo, David (by Michaelangelo – and not the ninja turtle), Boboli gardens, a slew of essential museums and galleries, shopping… none of which you should skip, and many of which that sadly require queuing (cue fidgety husband). Well, isn’t this sentimental. I’m going to go have a sarcasm sandwich now. *Come to think of it, it was the afternoon of the World Cup Italy vs. Urugauy game… so probably not anything similar to a hearty (?) Italian GodFather scene as I’d thought. Watch – Chaumet. Hat – Hoss Intropia. Dress – ASOS (similar in yellow). Slides - Office. Bag – Saint Laurent ‘Lulu’. Earrings – Baublebar. Blazer – Zara (similar). Let me start by apologizing how I abandoned this blog like last year’s gym shorts, scrunched at the bottom of the bag, ferried back and forth daily in the hopes of reviving the once-faithful routine while letting it gradually pickle away in a salad-toss of loose change and croissant crumbs… Pickle and Cube – preserved past natural expiration date and satisfyingly (?) sour… yep, that sounds about right. Full of Vitamin A they say though, A for Asshat blogger maybe. Truth is, adult life came knocking and I didn’t want to answer the door in my Spongebob PJ’s – or whatever hobby bloggers wear in this particular analogy. So, naturally the blog was put on the back burner while I attended to new challenges and deadlines, paying bills and saving up for boring things like new vacuum cleaners. Then it hit me, that this ‘blog’, in its overdue/sour entirety, was in fact also a great part of the so-called ‘adult life’, because during the six-ish years of dogged devotion to it, it had also grown up with me. And speaking of dogs, isn’t six dog years 37 in human life? Well then, looks like I’ve got lots to catch up. Farfetched analogies aside, I just wanted to say that I’m back. Probably not unconditionally but 100% in thoughts. Call this a re-starting of the engine, or even a direction change, but I’m planning to take this old-timer forward one month, one theme at a time. What’s hump-month July without Travel – so let’s start with that. What are you doing tomorrow? Nevermind what you’re doing, you’re coming over to Aubaine Marylebone (upstairs) to hang out with me and six other babe (yes) bloggers over cake. We also will be hosting a yard sale simultaneously and may or may not swindle your hard earned ££$$ in exchange for a cute pair of Givenchy’s that you’ll love forever. It’ll be fun, I promise. Bloggers include: Charlie Girl a la Mode, Alice of Alice Point, Hedvig of Northern Light, Peony Lim, Abi of Abimarvel and Carrie of WishWishWish. Do drop by anytime between 10:30am and 5pm, the address is 7 Moxon Street, W1U 4EP London. Theoretically it’s cash-only but as we’re children of this century and will be equipped with Paypal app too, should you be lacking a coin or ten, so if you have ATM allergies, download the app tonight! I’ll be carting over my goods (from ASOS to Alaïa + and most of this), prices start at £1. My sizes are UK8-10 for clothes, UK5-6 for shoes, but collectively we’ve got the whole spectrum covered, small to scrumptious, so not to worry! Aubaine is giving us a special breakfast menu (you know me) for early birds, and an all-day burger option for pigeons like me. Also, for our non-UK readers & followers, I will be posting up yard-sale priced goodies throughout the day on my Depop account (find me under @parkncube) so do keep an eye out, the app is available for Apple and Android.